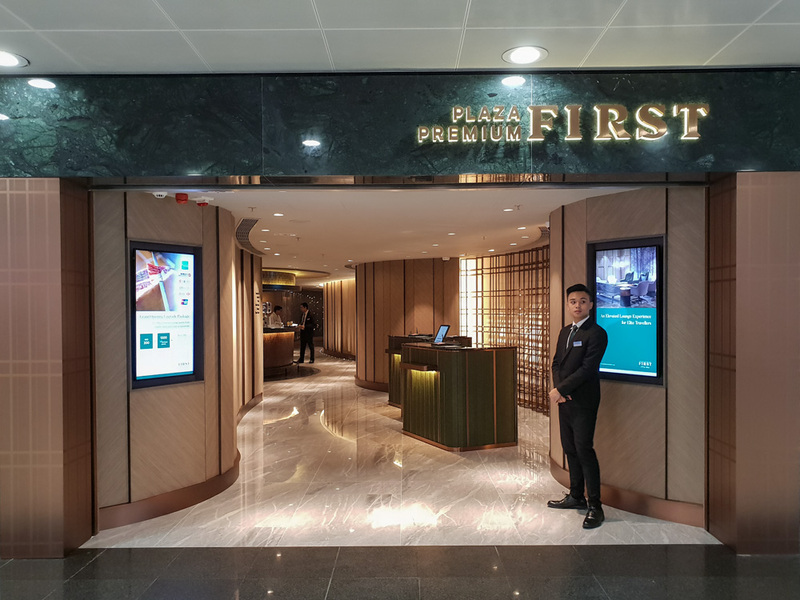 Point Hacks is excited to be the first site to review the new Plaza Premium First Lounge Hong Kong. 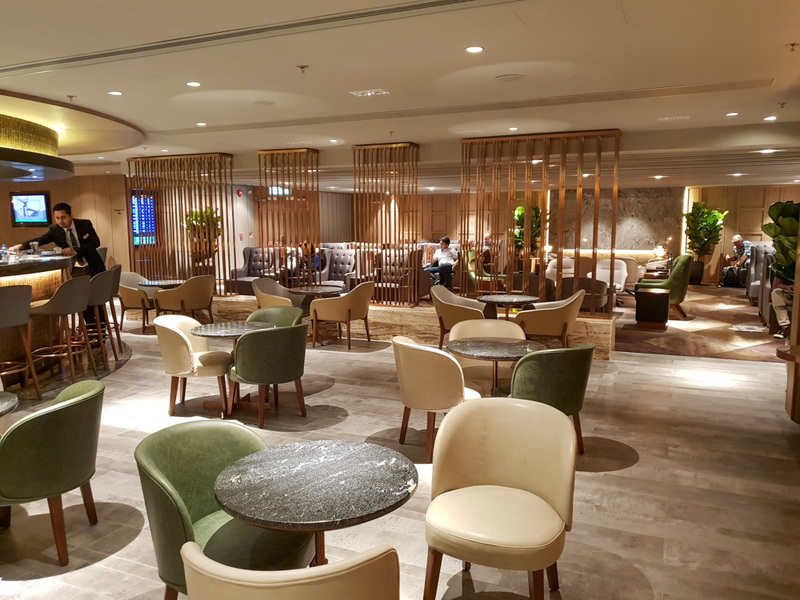 The lounge had a soft opening in early July 2018 and the official launch was on 25 July. 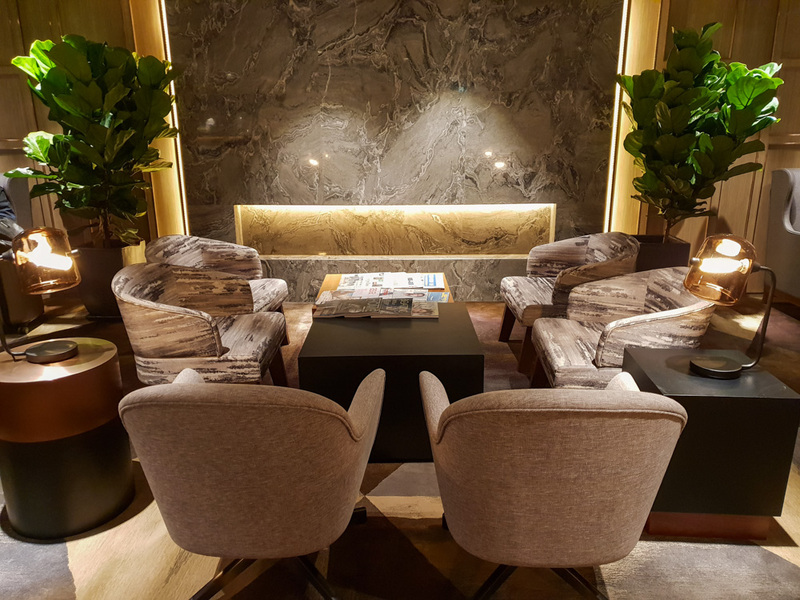 We visited the lounge just three days prior to the official launch. 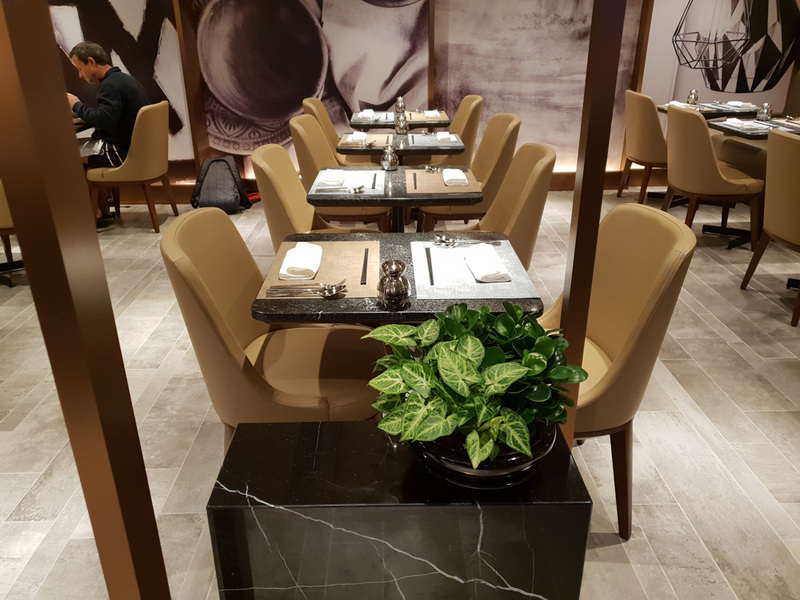 Recently on a trip from Hong Kong to Melbourne, I discovered that this new lounge had opened. 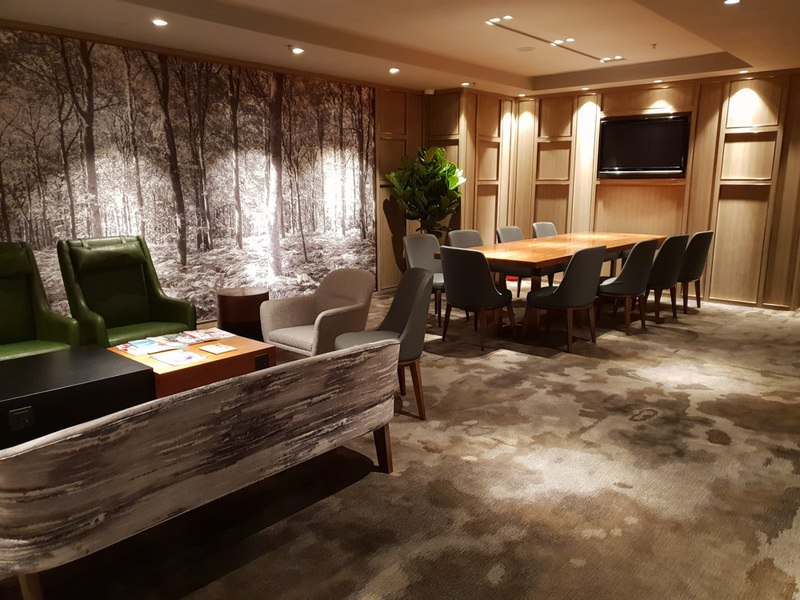 This lounge is part of Plaza Premium’s strategy of moving into the ‘First Class’ travel market and it is the only second ‘First’ lounge in the network after Kuala Lumpur. Needless to say, I was excited to test it out. 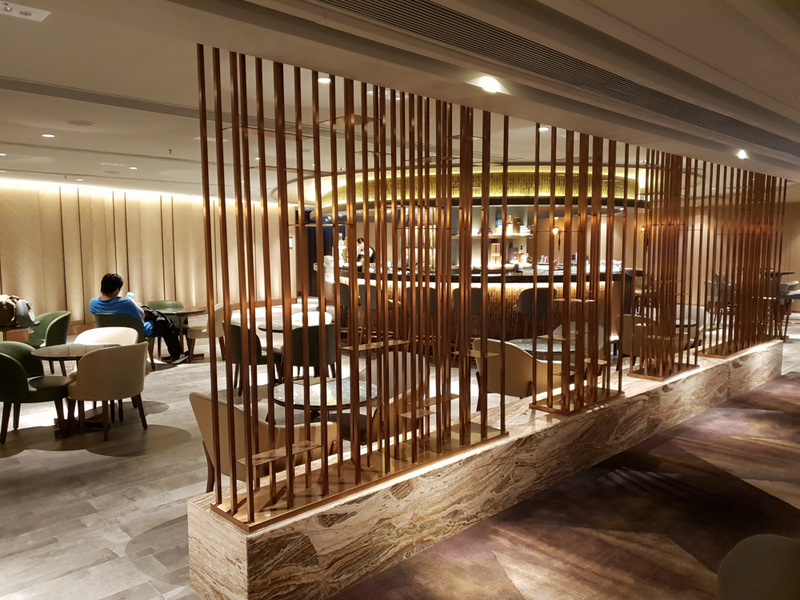 This lounge is a separate entity to the other Plaza Premium Lounges at Hong Kong Airport. 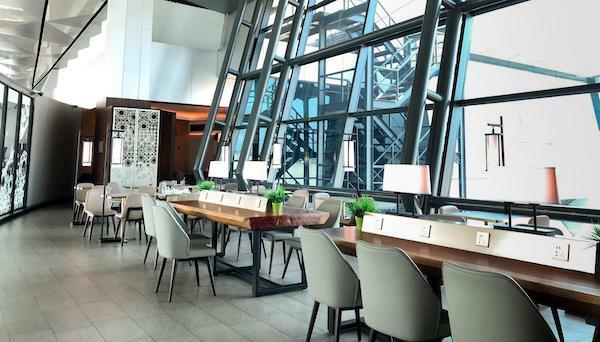 The lounge is located in Terminal 1 on Level 6 (Departures Level) near Gate 1. 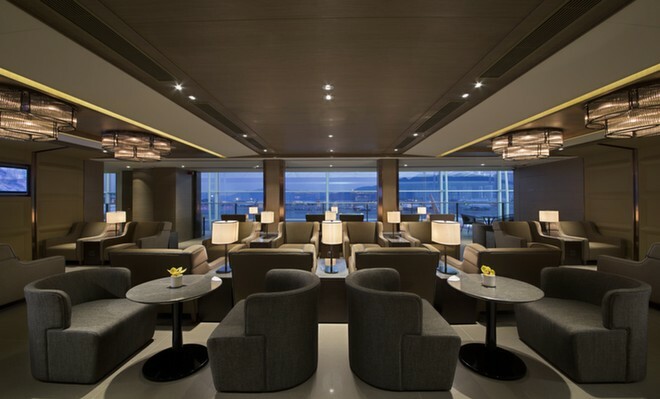 The Plaza Premium First Lounge Hong Kong lounge measures approximately 8,700 square feet. 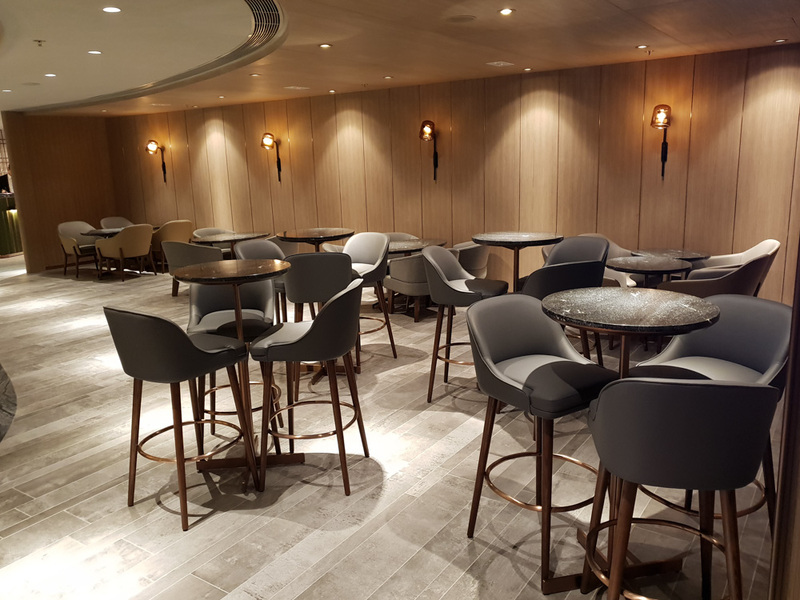 It is split into several sections including an à la carte restaurant, a bar, general seating, a VIP/meeting room, and a rest/work zone. 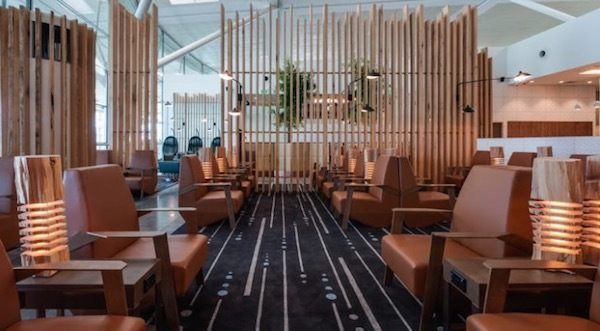 The decor is a step up from your ‘Business Class’ lounge—it looks very upmarket, using dark-jade-green, camel- and grey-coloured chairs, timber panels, stone floors and chocolate-coloured carpets. 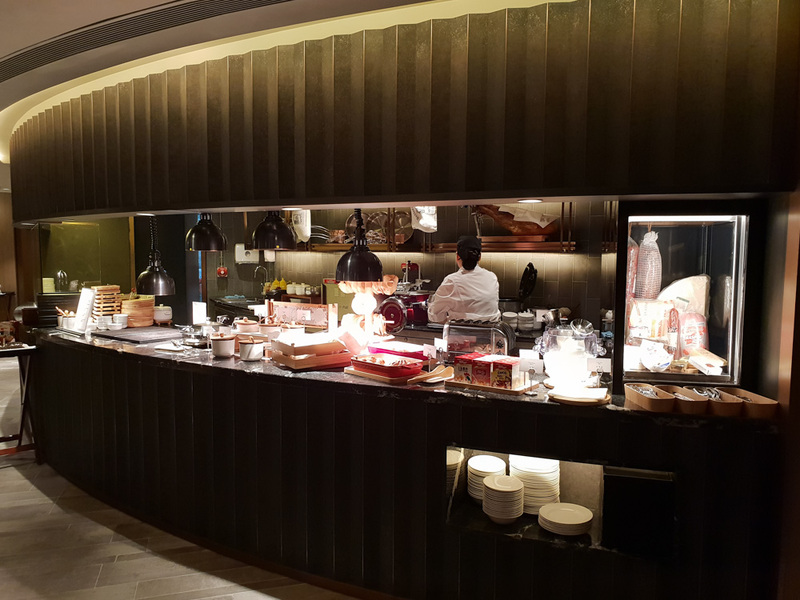 The seating capacity is 250 guests, divided into the restaurant, general area, work and bar. There are four ‘rest’ chairs, occupied the whole time I was there, in the rest area. I did find it odd that the rest and work areas were in the same section. 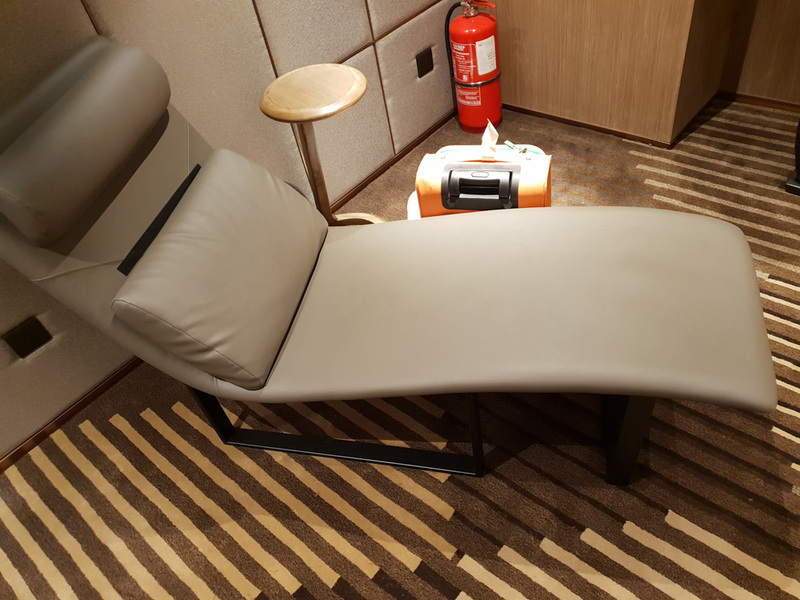 Because the four rest chairs were occupied, passengers used the work-zone bench sofa to sleep. So during my visit, I was working on my laptop and could hear people snoring. 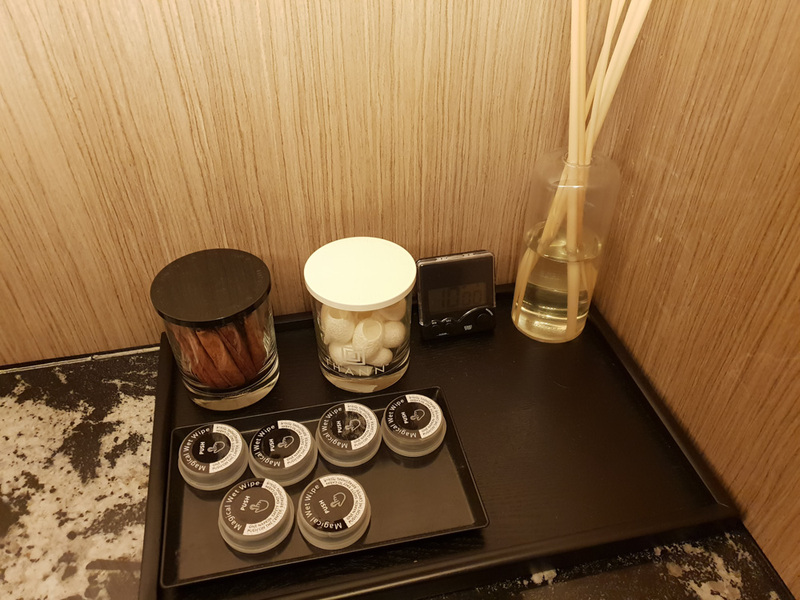 The lounge offers showers and a complimentary ten-minute massage, which you book when you enter the lounge. 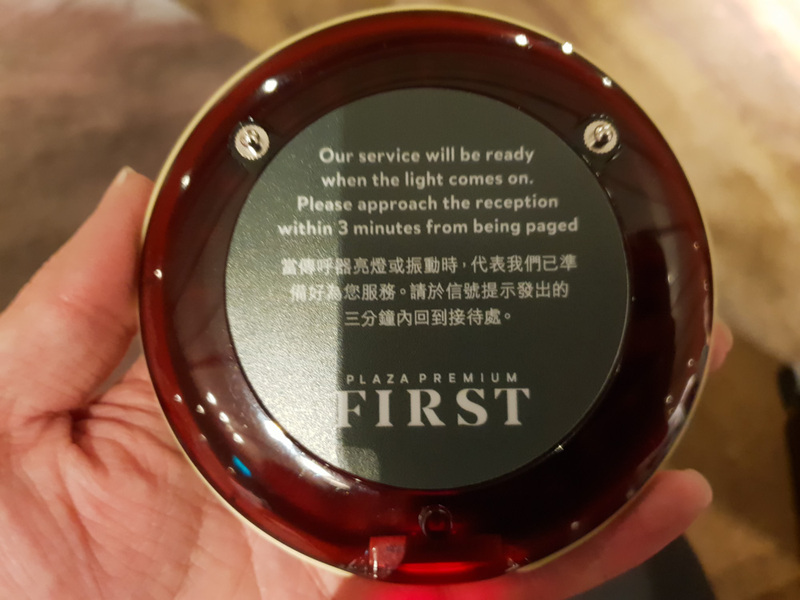 You are given a buzzer (like you get at some restaurants) which alerts you that it is your turn for the massage and/or shower. 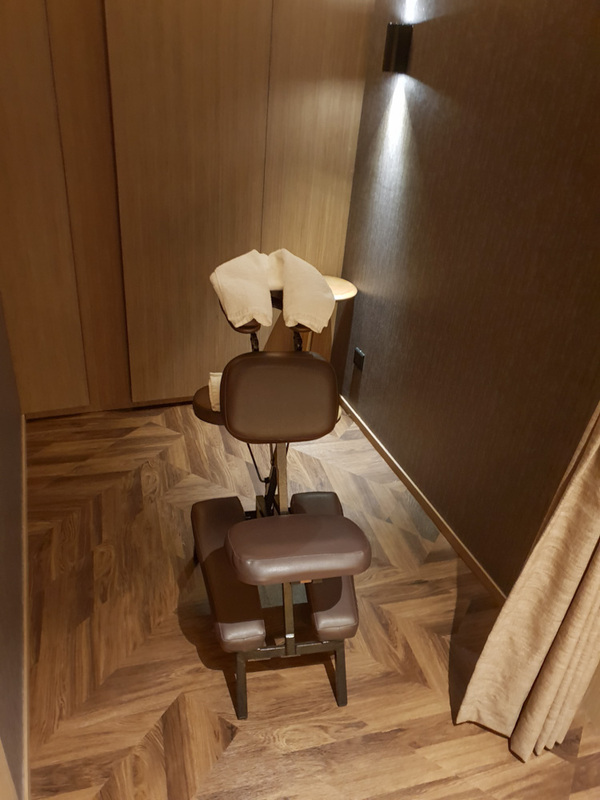 Whilst I was impressed with the ten-minute massage and my masseuse was really good, it ended too short—I felt relaxed and wanted more, however, I did not ask whether it was possible to extend it for an extra fee. 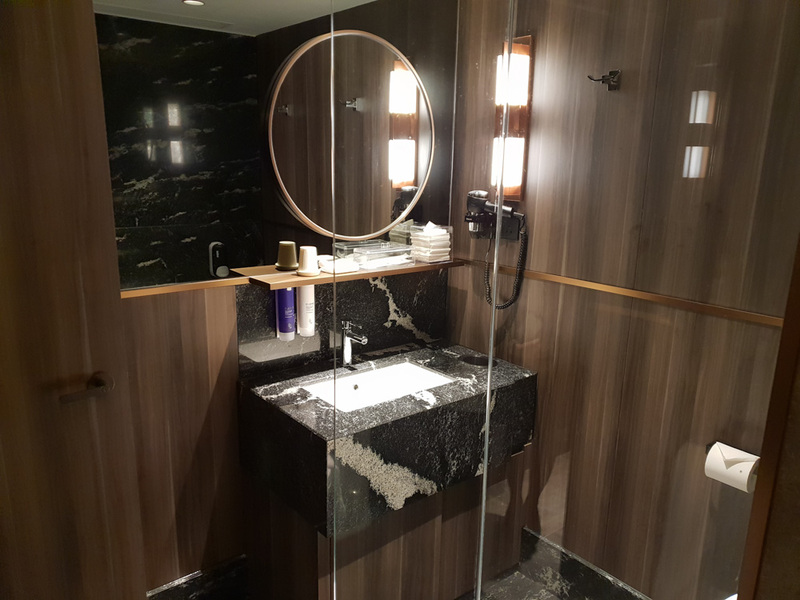 The showers and bathroom are very clean. 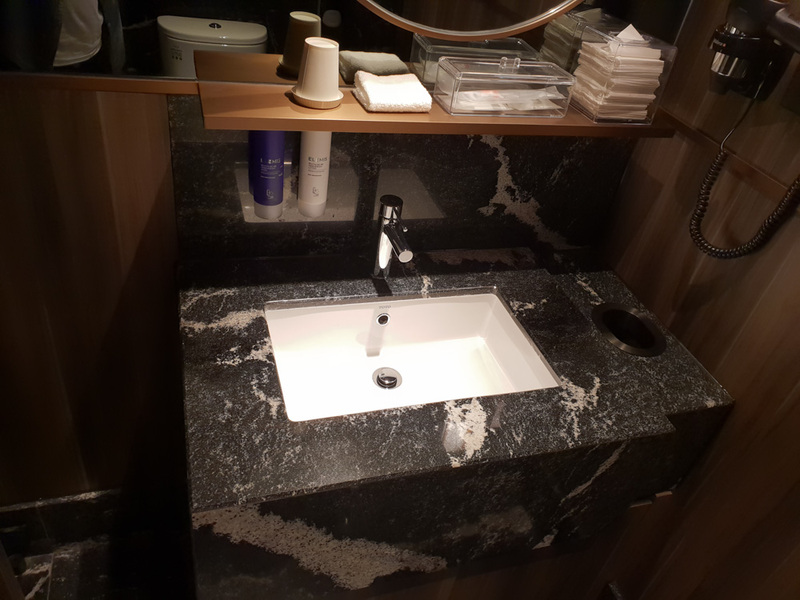 It is very spacious and you have room to store your luggage and hooks to hang up your clothes so they do not get wet during the shower. 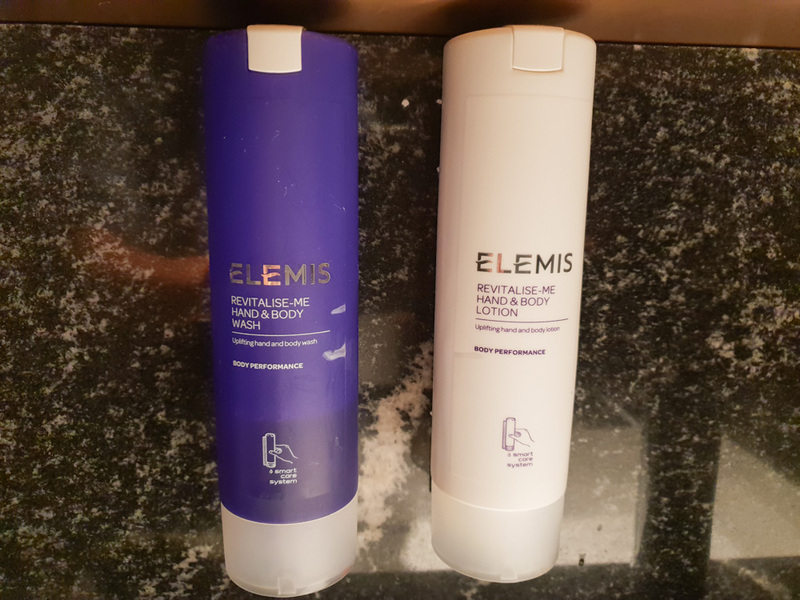 The amenities are Elemis, which is the same brand used in the British Airways First Class lounge. They are available within the bathroom, along with toothbrushes and a hairdryer. The AeroBar is probably the centrepiece of the lounge, but I would say that since I love to drink. 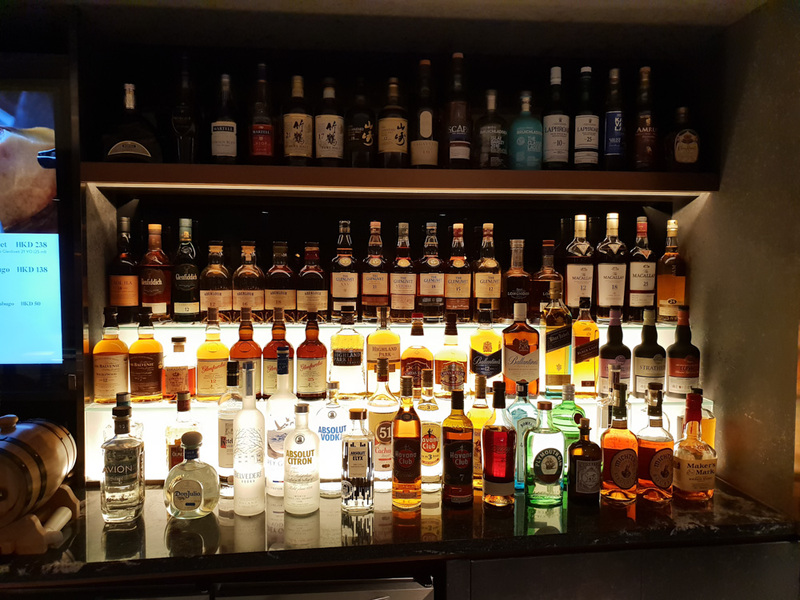 What is impressive is the whisky bar, with around 50 labels including exotic ones from India and Taiwan. 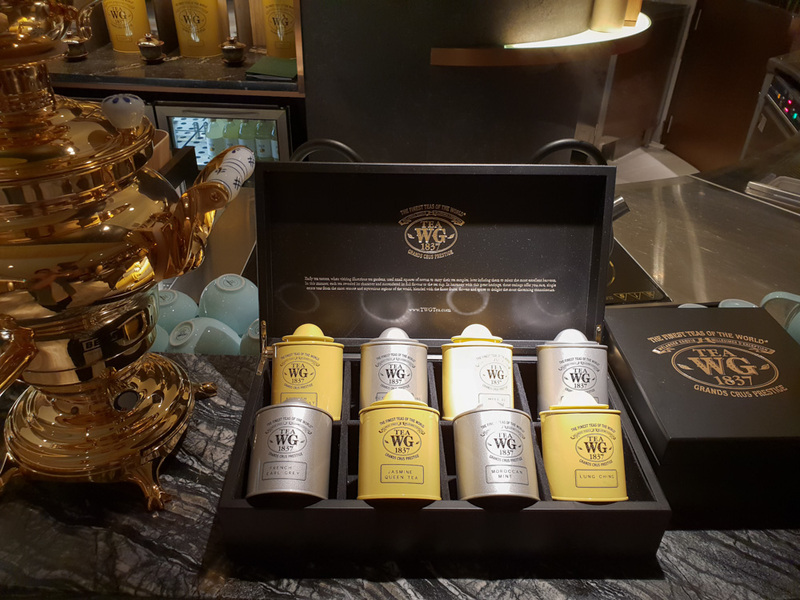 The tea is TWG, which is the same that Singapore Airlines uses. 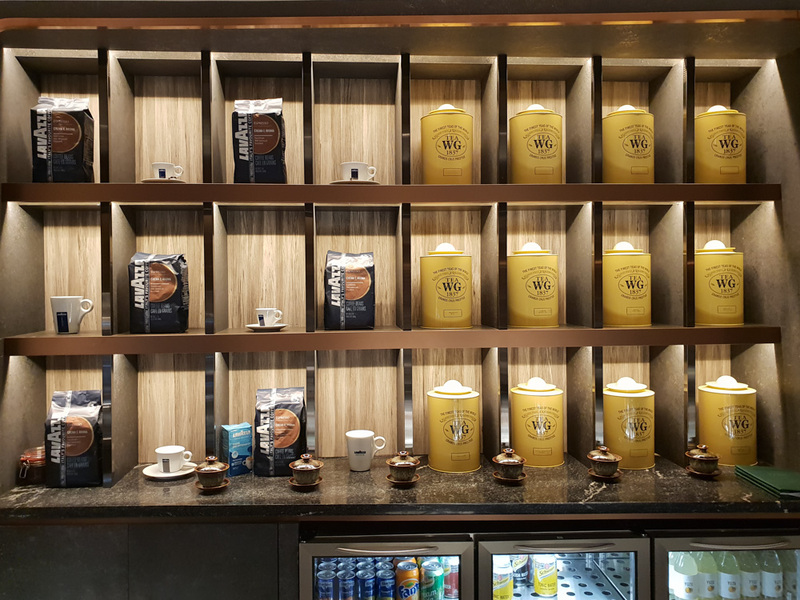 There is also barista service and freshly-squeezed juices available, including watermelon, apple, orange, grapefruit and mango. The champagne on offer is G.H. Mumm Cordon Rouge N.V. 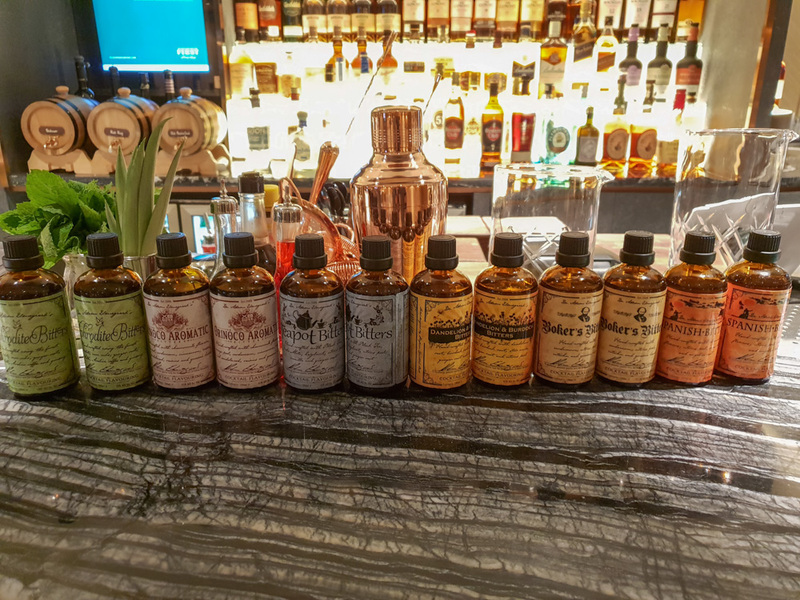 They had their own signature cocktails like Aprodite’s Bitter, Orinoco Aromatic, Teapot Bitters and Dandelion. 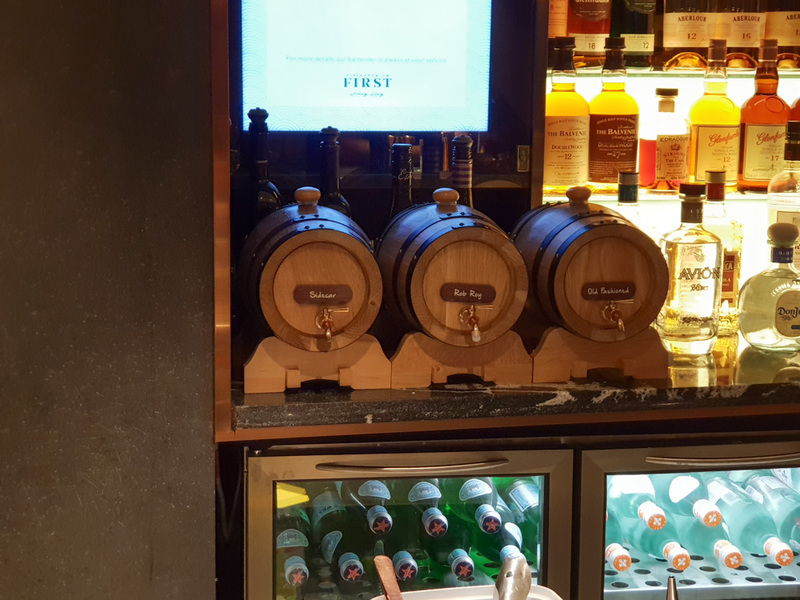 However, if those don’t interest you, the bar staff can make any cocktails you request—my favourite is a Long Island iced tea! 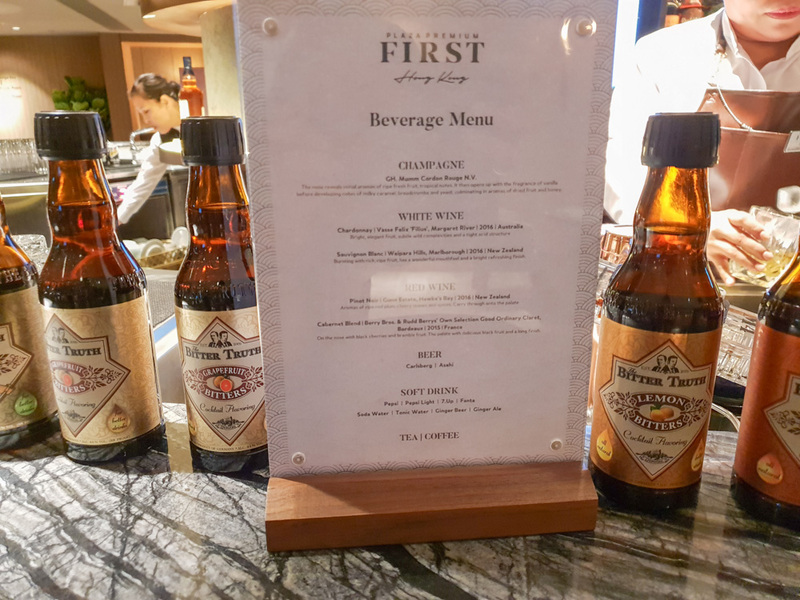 Both alcoholic and non-alcholic beverages are complimentary, however, you can only drink the base-level whiskey—the premium labels cost extra and there is a ‘Journey Package’ you can purchase, where you taste several labels. 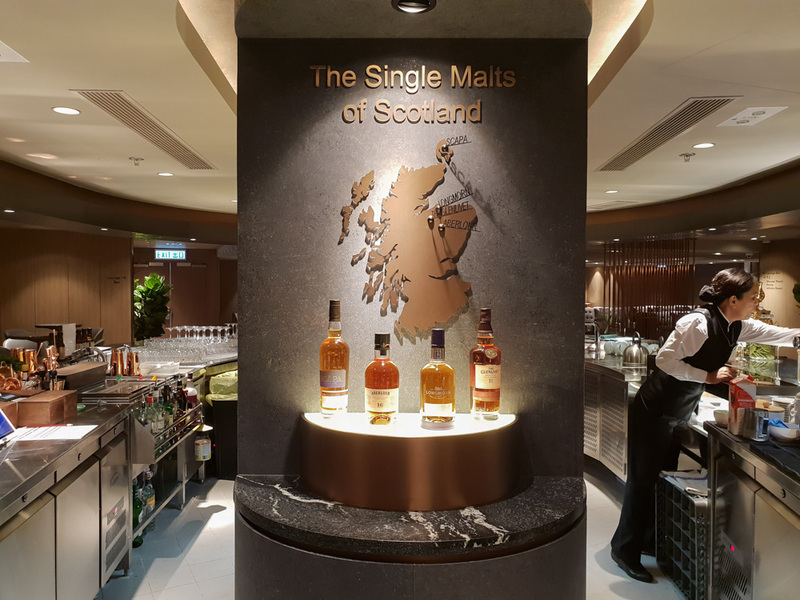 I suppose for me that was a bit of a let down because if you were a walk-in, you would have paid HK$700 (~$AU$120) and to find out you can not drink top-shelf whisky, you would be a bit annoyed. 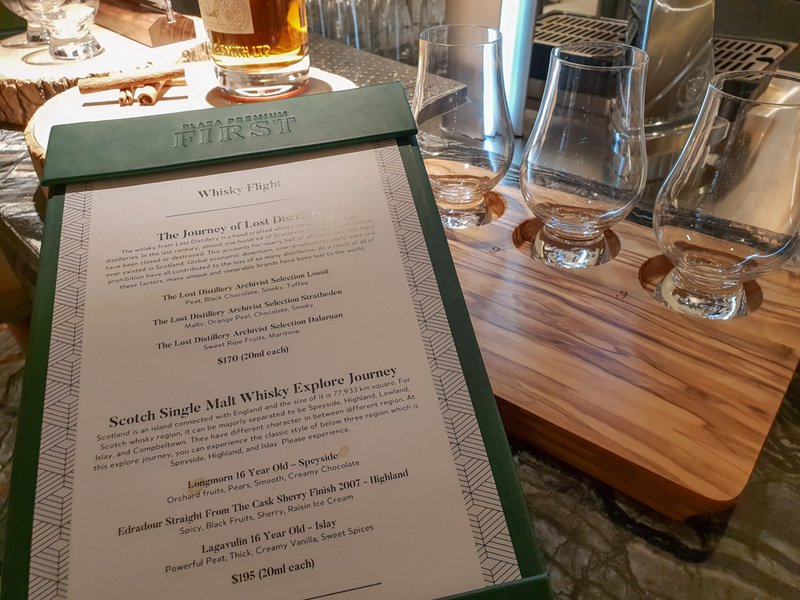 There are two whisky flight journeys available, priced at HK$170/195. 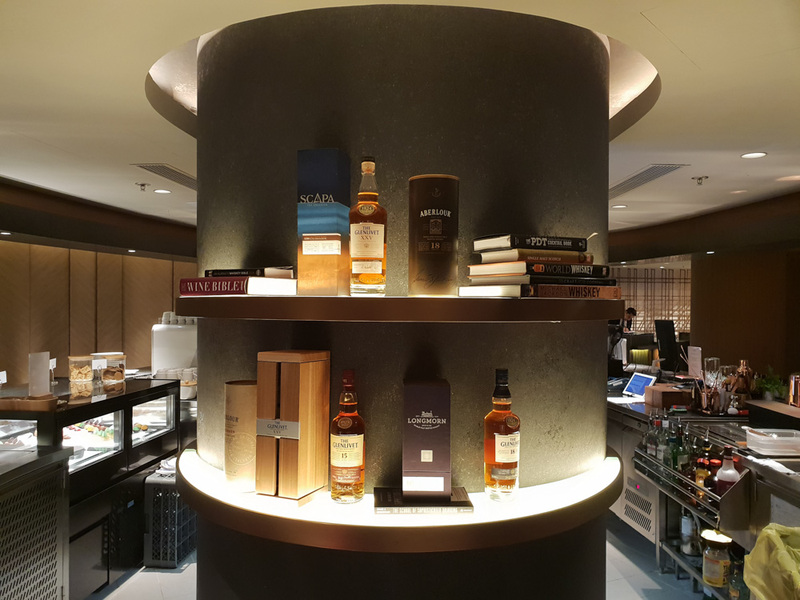 Having said that, the complimentary selection had 11 whiskys, bourbon, vodka, gin, cognac, rum, red & white wines, champagne, two beer brands (Carlsberg and Asahi), and juices. 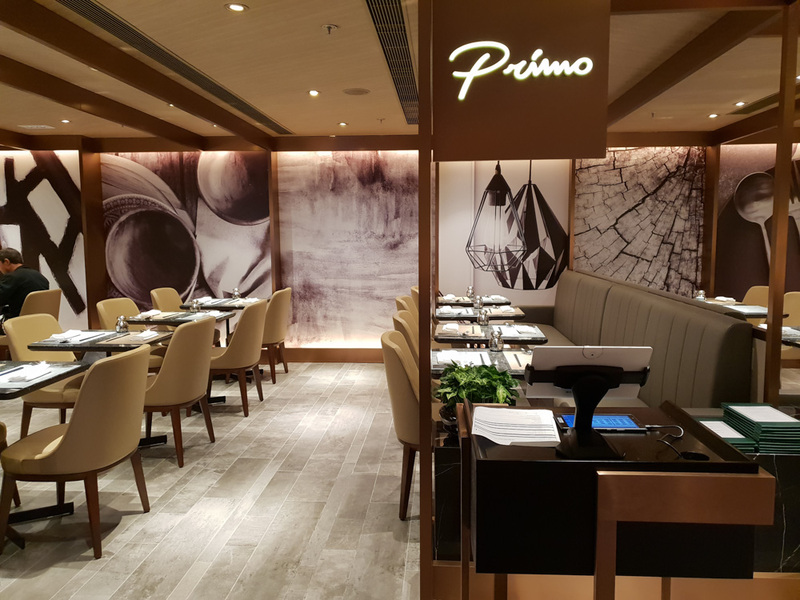 There is a buffet of pastries and dessert treats, however, what sets this lounge apart from other Plaza Premium lounges is that it offers à la carte dining, called ‘Primo’. 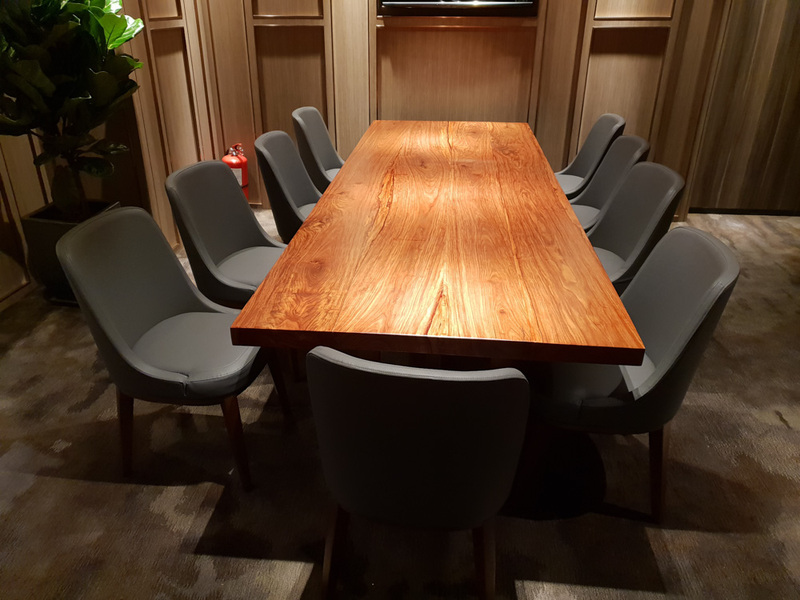 The restaurant seats just under 50 guests. 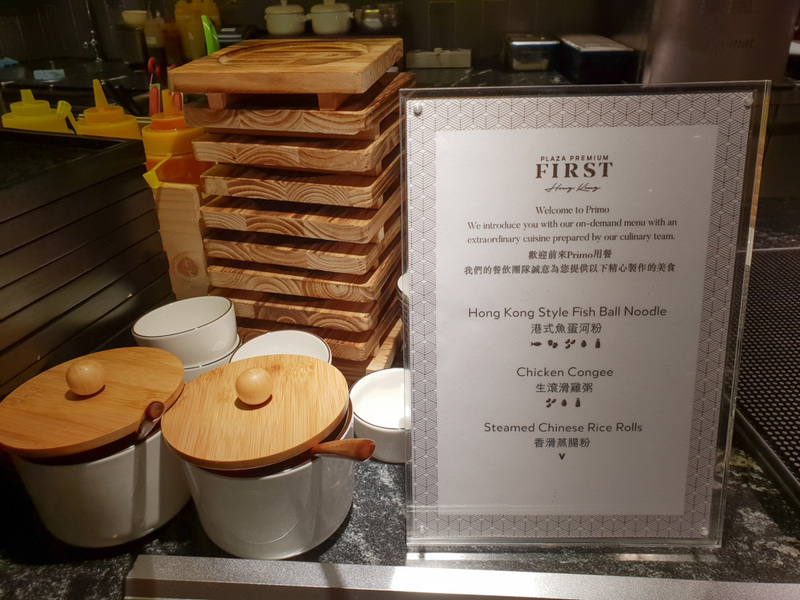 From 6-11am, there is a breakfast menu; from 11am until midnight, it is all-day dining; overnight from midnight until 6am, only the fish ball noodle soup is available. 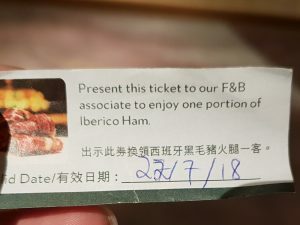 Also when you enter the lounge, you are given an Iberian ham coupon, where you present to the server and they will give you a serve. 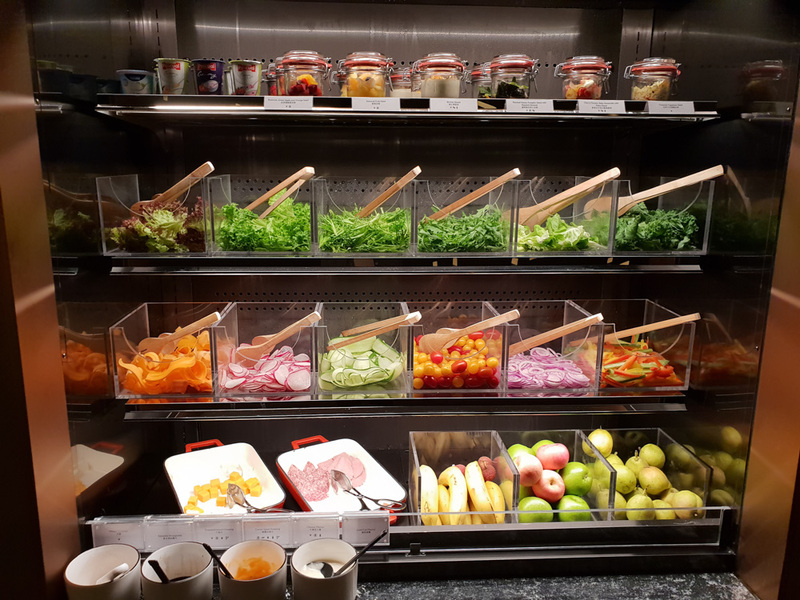 There isn also a fresh salad, fruit and yoghurt wall. 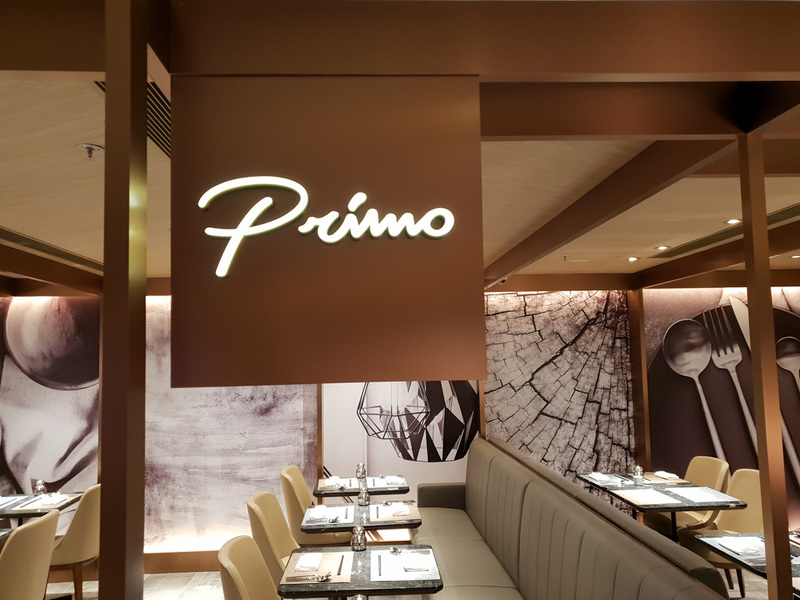 I liked the thoughtful touch such as the kids’ menu, which offers simple dishes like spaghetti bolognese, mini beef burger, and macaroni & cheese. 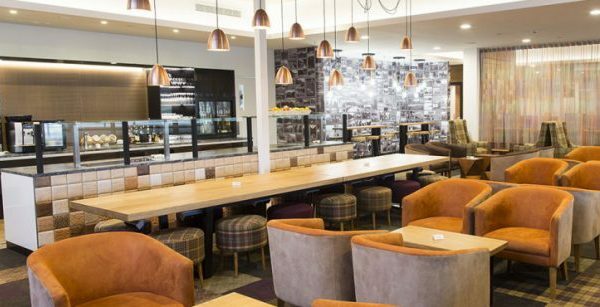 Although the breakfast menu is only served until 11am, they do have an all-day breakfast, if you fancied some eggs, mushroom, beans and bacon, etc. later on. 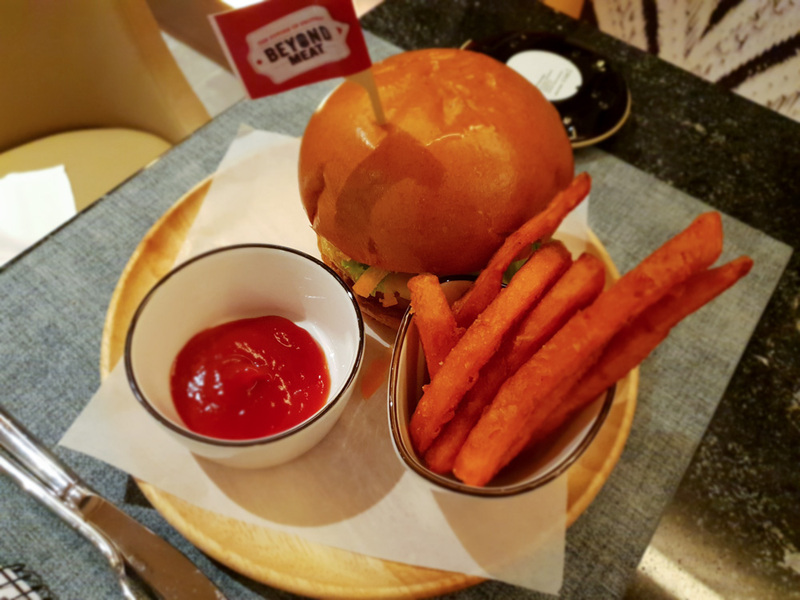 The restaurant’s signature dish is the Beyond Meat burger with sweet potato fries. Everybody probably knows about this—it tastes like beef but it is made from vegetables. Surprisingly, it does taste like beef but the texture was a bit funny and reminded me of the movie ‘Soylent Green’—look it up on IMDB. From the all-day dining menu, if I had room in my stomach, I would have gone for the Maine lobster and capellini served with lobster veloute. The service was great during my visit. 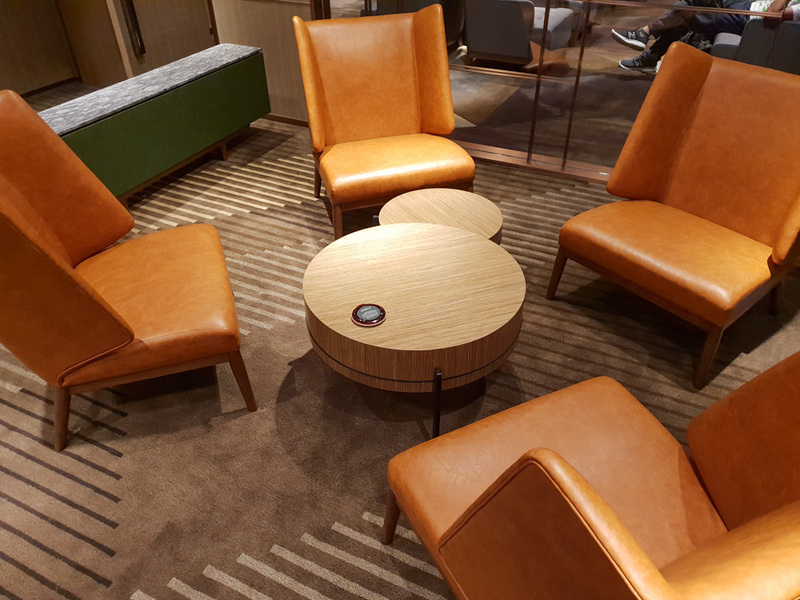 The ‘lounge ambassador’ went to each passenger and asked about their experience with the lounge, check up on how things were going. 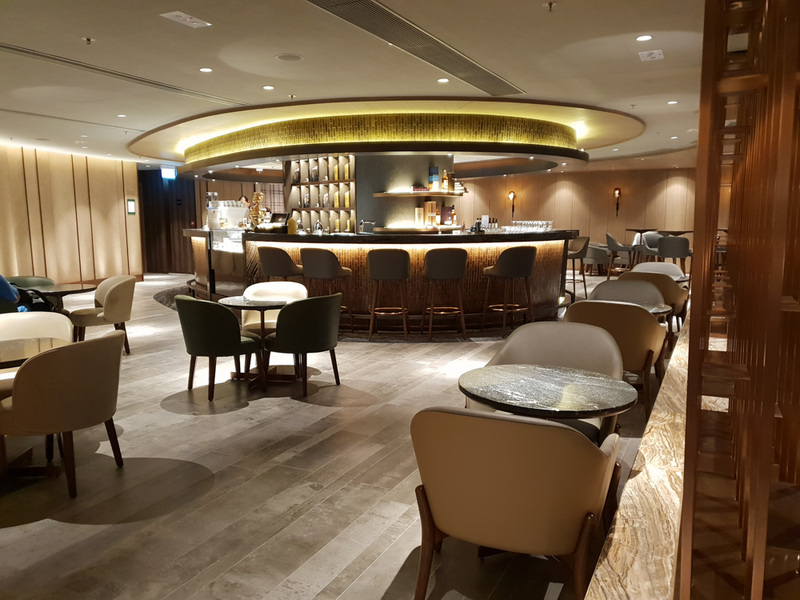 They also have staff members roaming the lounge, offering to top up drinks or bring drinks to guests as well as clear away plates, but they were not in my face and if you were a passenger who wanted privacy, they will not disturb you. 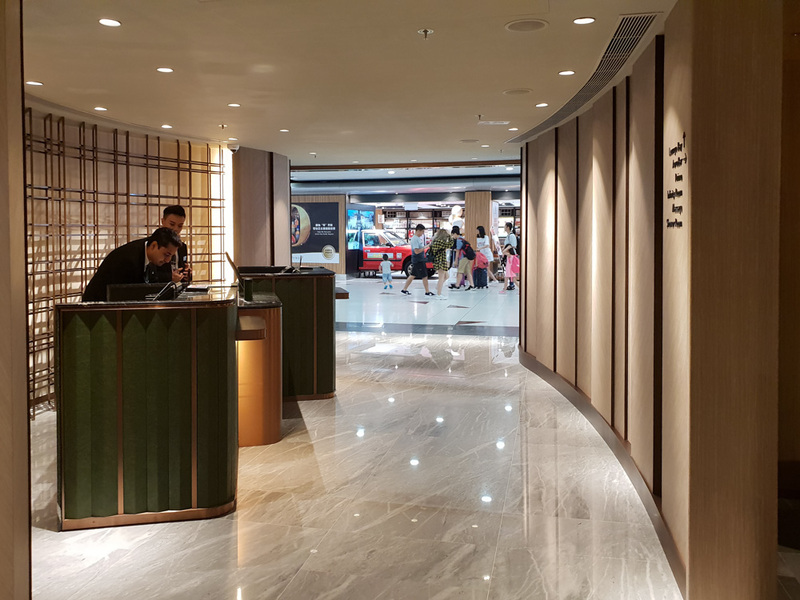 At the time of my visit, Priority Pass and American Express Platinum cardholders had to pay an additional fee of HK$200 (~AU$35) per person for entry. I was informed that this fee was only for a ‘promotional’ period and Plaza Premium has not decided what they will set the fee following the promotional period. 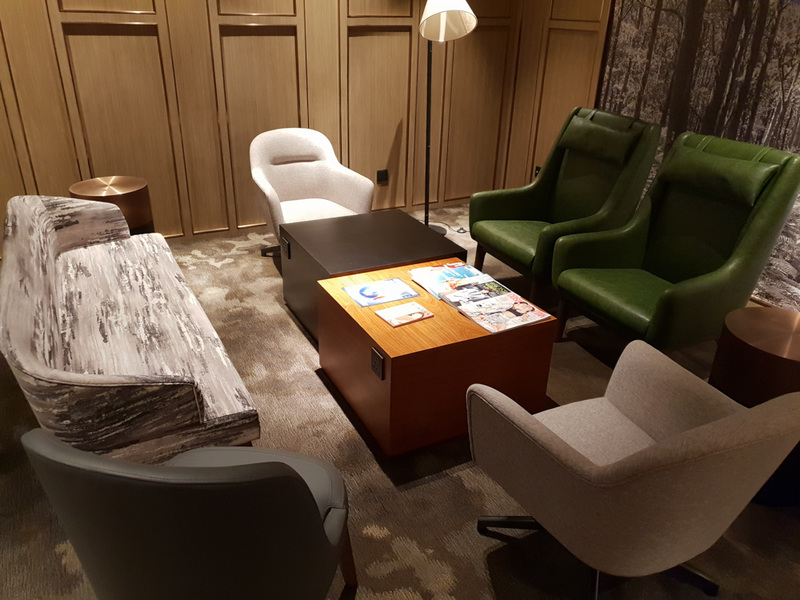 For all other walk-ins, the fee is a much higher HK$700 for the promotional period. The maximum stay is three hours. 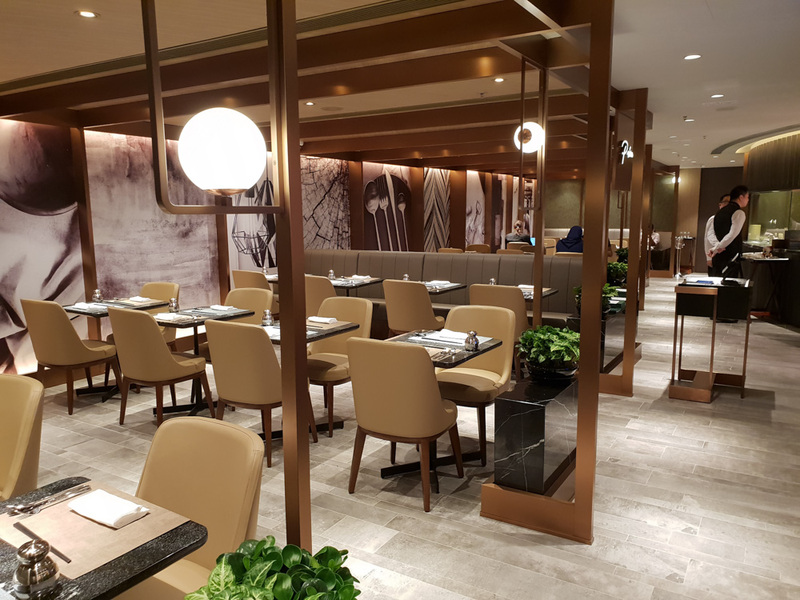 During my visit, there was a lot of confusion from Priority Pass and American Express Platinum cardholders, who were not aware that they had to pay an additional fee for entry, so many decided not to and were redirected to the regular Plaza Premium lounges or the American Express lounge. 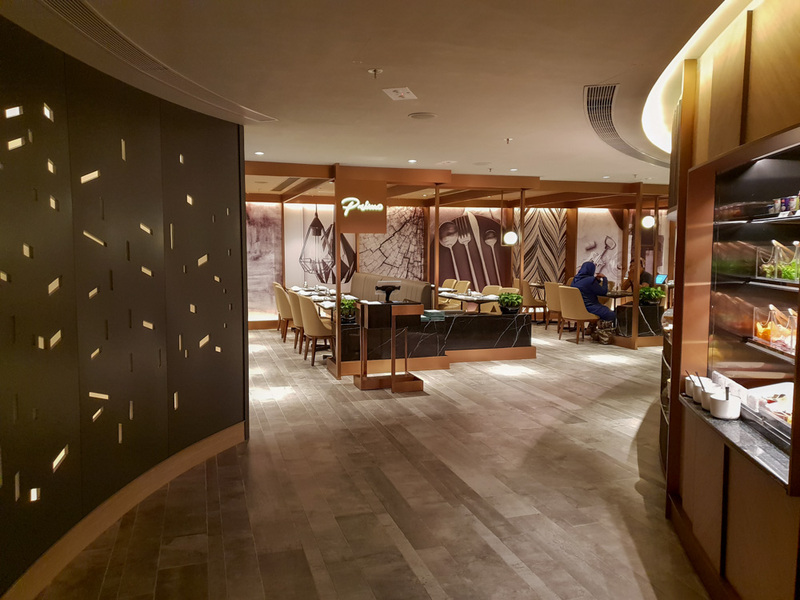 I enjoyed the experience and because of the additional fee for entry for Priority Pass and American Express Platinum cardholders, it meant the lounge was quieter. During my visit, there were probably around 60 guests, so it did not feel like a zoo. 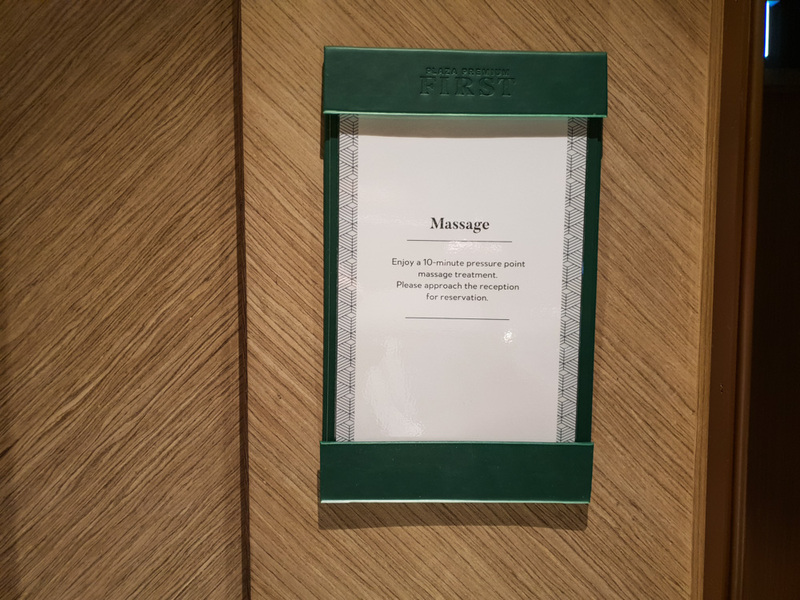 The complimentary massage is a bit short, though, at only ten minutes. The masseuse was very good nonetheless but just as I was getting relaxed, the alarm went off and my time was up! 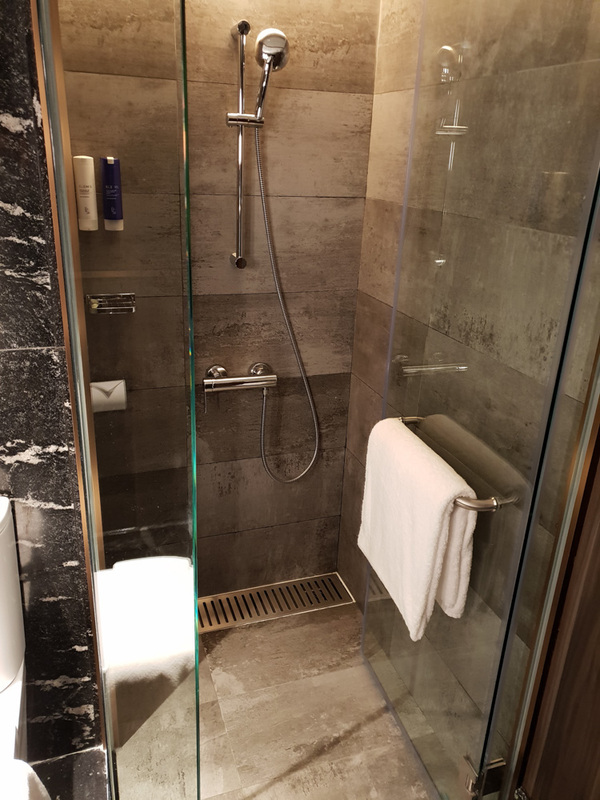 The showers were clean and well-designed, so you would not get your clothes, luggage and shoes wet. The à la carte restaurant is also a step-up. The menu is not cluttered—with 50 items, it is simple. And the meals were freshly cooked, not kept under a heat lamp in the back of the kitchen and warmed up on-demand. 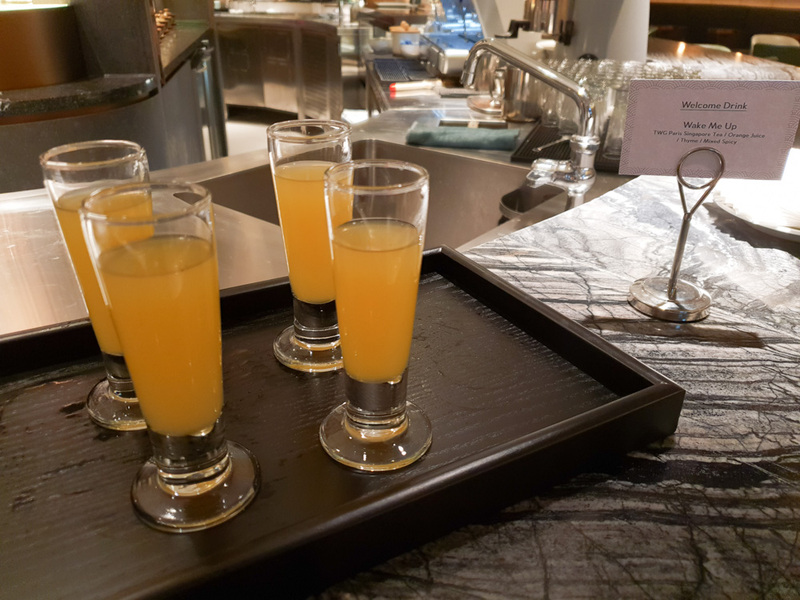 The bar and barista service was a plus for me, they had their signature cocktails but you can request any other cocktails. 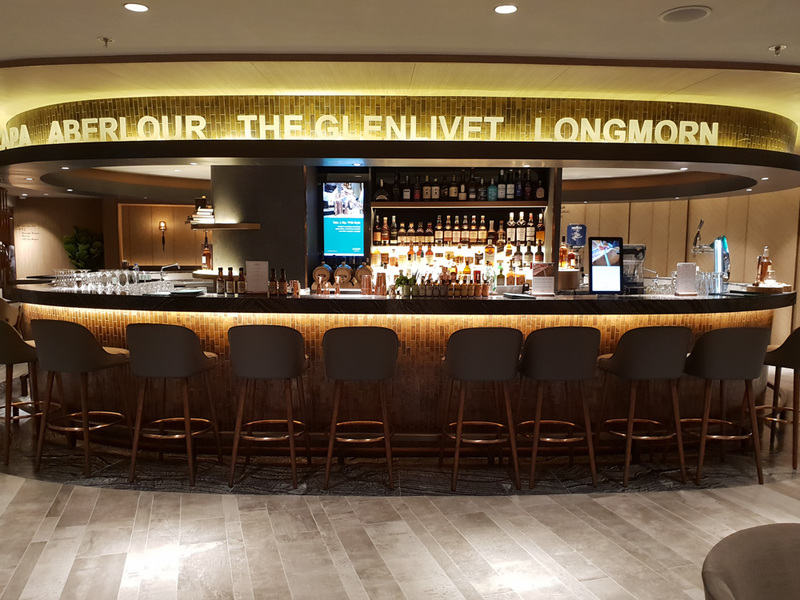 However, I was somewhat disappointed that not all 50 whisky labels are available for guests as part of the lounge entry fee, and the premium labels cost extra. 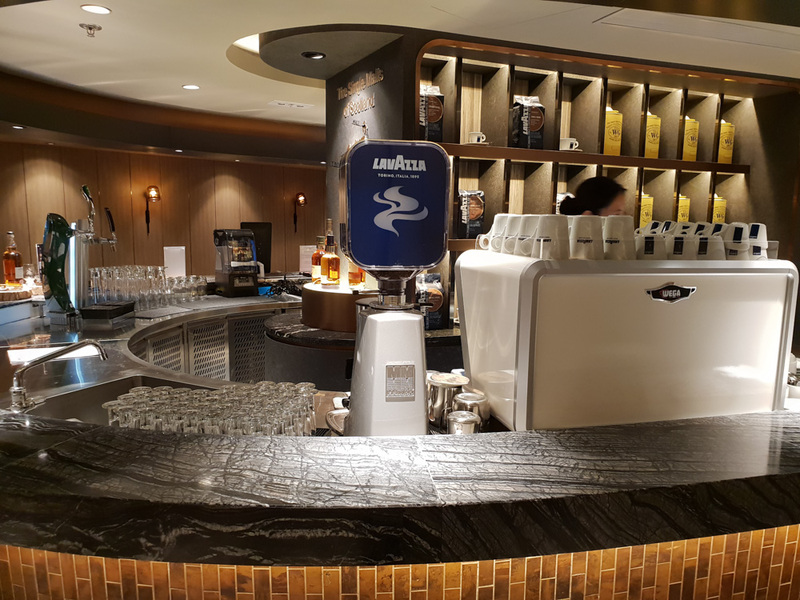 Also only two draught beers are complimentary—Carlsberg and Asahi—with other brands costing more. 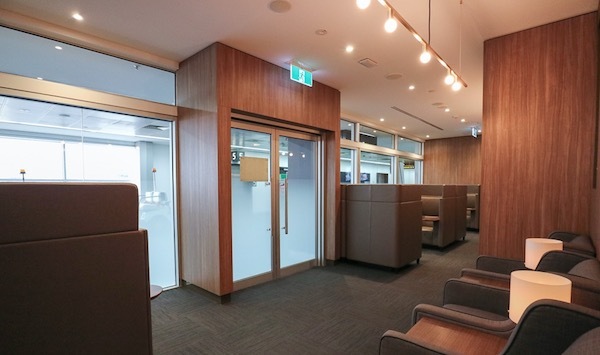 So I think a guest who has paid the full price to enter the lounge would (reasonably) not expect to pay more. I did mean I’m flying out on VS (Virg Atlantic) but have a 6 hour layover and I’m coming in on VA (both business). 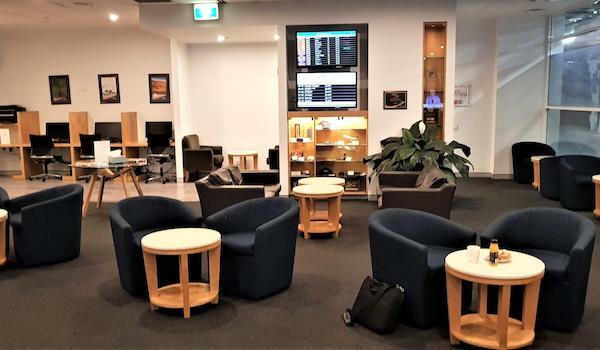 Would it be worth paying for this lounge over the VS PP lounge as I think the VS access only opens 3 hours before my (late night) departure. Great review Nelson but you’re right, one wonders whether there’s real “value” in that extra entry charge. BTW, why the American (or Irish) spelling of “whisky” throughout your review? Thanks Graham H, Hahaha I went with the spelling that the lounge used, normally I spell it Whiskey. In fact, when editing this report, I had to spell and replace my spelling with the American spelling. Anyway, personally, I would pay the $35 AUD to use it again. I appreciate a quieter lounge. But I wouldn’t pay the $90 USD. 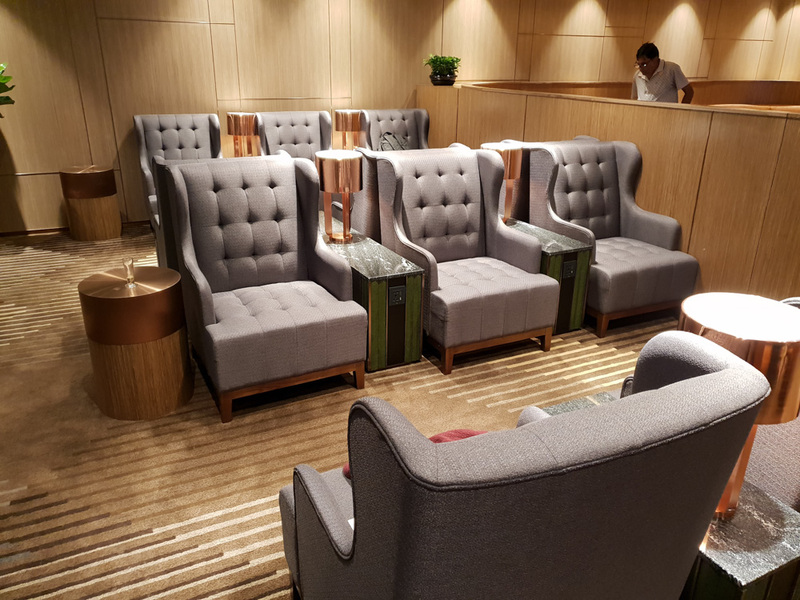 Is this lounge open to VS business class guests out of HK? No, those passengers access The Club Autus. More here. 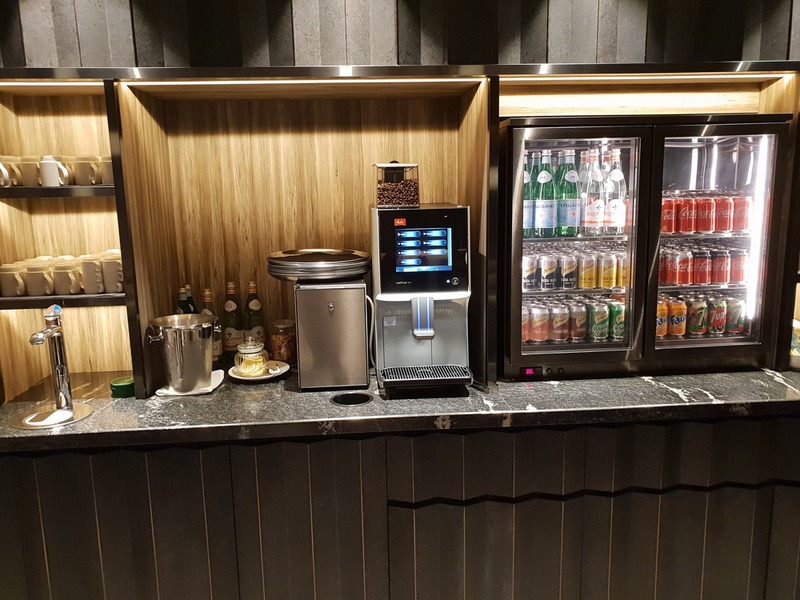 Hi Maike, this lounge is open to all passengers but it is not complimentary, if you were flying VS (or did you mean VA? ), you can walk-in and it costs $90 USD. If you are an American Express Platinum or Priority Pass member, you get charged a discounted $35 AUD fee.